An opposition-sponsored bandh began on Thursday morning in Andhra Pradesh where state-run bus services have been suspended and educational institutions shut. 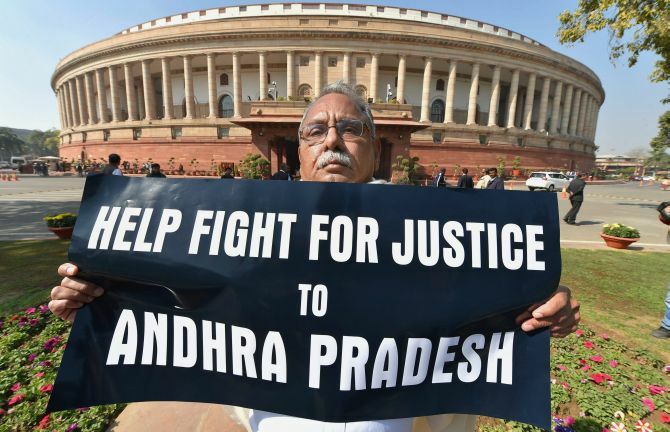 Opposition parties are enforcing the day-long bandh to protest the 'failure' of the Centre to implement the Andhra Pradesh Reorganisation Act, 2014. Parallel to this, the ruling Telugu Desam has been organising rallies across the state in solidarity with its MPs 'fighting in Parliament to secure the state's rights'. "People and intellectuals irrespective of political affiliations should stand in solidarity with our MPs, who have been fighting in Parliament for the state's rights," state TDP president and Energy Minister Kimidi Kala Venkata Rao said. The AP State Road Transport Corporation suspended its bus services across the state in view of the simultaneous agitations. Educational institutions declared a 'holiday', while business establishments remained shut. A senior police official said no untoward incident was reported so far and the bandh was continuing peacefully. The Left parties called the bandh demanding that the Centre honour its promises and implement provisions of the Reorganisation Act, which led to creation of Telangana. The main opposition Yuvajana Shramika Rythu Congress, the Congress and the Jana Sena extended support to the bandh. YSRC president and leader of opposition Y S Jaganmohan Reddy declared a one-day break from his ongoing foot march in view of the bandh.He is currently in SPS Nellore district. Left workers staged dharnas in front of several Road Transport Corporation depots and also took out rallies in important towns. In Kurnool, Guntur and Tirupati, YSRC activists joined protest rallies. Opposition parties have been protesting the 'injustice' done to the state in the Union Budget 2018-19 and the Centre's failure to implement the Act in its letter and spirit. The Act deals with a host of issues like division of assets and liabilities of institutions between AP and Telangana and release of funds for Polavaram project and other schemes in Andhra Pradesh. Thin attendance was reported in government offices and public sector undertakings like Visakhapatnam Steel Plant, Visakhapatnam Port Trust, National Thermal Power Corp and Hindustan Shipyard,and other Transport services in Visakhapatnam were paralysed as private and public bus services, autorickshaws, lorries and trucks remained off the road. Commercial establishments and hotels downed shutters in the port city while government and private schools and colleges declared a 'holiday' in view of the bandh. The Andhra University (AU) announced suspension of classes to avoid inconvenience to students. Classes would be suspended at the Visakhapatnam-based AU and its affiliated colleges, said Registrar V Umamaheswara Rao in a statement.